I bought this scanner to replace an old Brother ADS-2300. 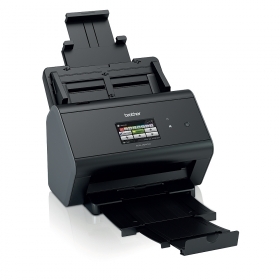 The 2800 is fast and well-suited to coping with multi-page documents. It scans to file, image, PDFs (including searchable PDF), as well as scanning directly to email. I have a good deal of digital archiving to do and the ADS-2800 is already proving an ideal scanner for the task. Highly recommended. Arrived promptly. Not a pretty object, the picture against this review and all others I've seen convey that fairly and accurately. That's largely because of the slide in extensions to the paper bin and exit trays and it's good they do slide in and fairly easily. It was easy to set up and, at least so far with about a week of mixed though not very intensive use, seems excellent as a network scanner accessed over wifi from a Windoze10 machine. I would recommend it. The Brother ADS-2800W offers true wireless connectivity so there is no need to log on to a central PC or install software at multiple location points. Share information across teams and departments with minimum user involvement. Featuring fast, high quality 2-Sided scanning, the ADS-2800W offers improved performance and image processing with Kofax compatibility. Enhanced scan features include scan directly to your smartphone or tablet with the iPrint&Scan app (available on Apple & Android) and Outline and scan will only scan areas outlined in red pen. Scan to USB flash memory drives, cloud scanning allows documents to be scanned directly to cloud based programmes such as Evernote, Dropbox and Google Drive. Also scan to E-mails along with OCR scanning direct to Microsoft Word, Excel & PowerPoint.